Visit Third Place Books for free coffee, a scavenger hunt, photo booth, prize wheel, and author meet & greets all day! 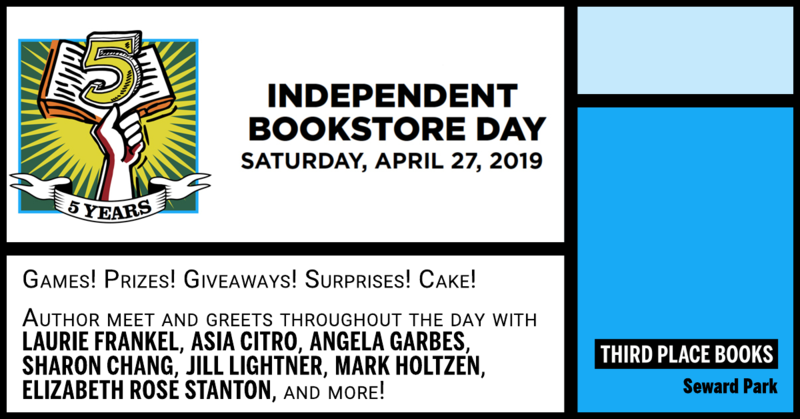 Among our featured authors will be Laurie Frankel (This Is How it Always Is), Asia Citro (Zoey and Sassafras), Angela Garbes (Like a Mother), Sharon H Chang (Hapa Tales and Other Lies), Jill Lightner (Scraps, Peels, and Stems), Mark Holtzen (A Ticket to the Pennant), and Elizabeth Rose Stanton (Bub). Check back here for the schedule in the next few weeks! If you visit three bookstores on the Seattle Bookstore Day map, you'll receive a 30% one-time coupon, good for any participating bookstore. If you visit all 21 stores on the map, you'll win a Champion Card, which allows you to receive 25% off for the entire year at all participating bookstores (card must be presented along with ID). Visit Seattle Bookstore Day for more information on the challenge.